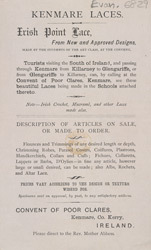 In 1861 Poor Clare Nuns founded a convent in Kenmare. It was just after the famine and they opened a school to help the local women to learn crafts to alleviate their extreme poverty. Young women and girls were taught embroidery, woodcarving, leatherwork and lace making. The women became very skilled in making attractively designed and beautifully executed lace that it became known as ‘Point d’Irelandaise’ or Irish Point Lace. The lace was sold to wealthy tourists and the women could earn as much as 18 shillings a week, a very considerable sum for the time.